Reminder bids close Sunday, September 10, 2017 at 6:00 pm. On Sunday the 10th a person does NOT need to have the high bid on a calf, they just need to have a bid on the lot they want. As long as you have a bid on a lot, you will receive a callback to bid again. We will start with the highest price calf on the bid board and work our way down. We will continue callbacks until we have only one person left on the calf. Let's say Joe has a bid in on Lot 1 at 3250 and is the first person that bid on that calf. We will call Joe back and say, "Current bid is 30,000, to stay in you need to be 30,250." Joe may choose to bid again and we will move to the next person on the list. Again as long as you have a bid in on the animal(s) you want call backs on, you will get an opportunity to bid. You DO NOT need to have the high bid on Sunday at 6:00 pm. They will all be bid off by phone. Usually it takes until Thursday of that week to get through all the lots, therefore you may not get a call back on Sunday night. If you have questions about the bidding process call Tim 765-541-0738 or Emily 765-546-0207. Update on the bid board as of Tuesday, September 5, 2017 at 10:45 am. Bid Board Update As Of August 25, 2017 at 9:30 pm. Honey is past Louisville and Junior National Champion and dam to many recent champions we’ve sold. Dam is full sib to Who Dat Lady. Dam was Grand Champion Female at Kansas City, Denver, Louisville, and Shorthorn Junior Nationals. As well as Supreme Female in the Louisville Junior Show. Lady Chrystal is the dam of Kansas City and Louisville Champion Shorthorn Female. Full sib to the Grand and Reserve Female at 2017 Chianina Junior Nationals. Full sib to many Champions including Stewart Skiles high seller last year with wins at Louisville, Houston, and KILE. Full sib to Who Dat Lady, Who’s Your Lady, and Clayton Main’s Reserve Supreme Female at 2017 Indiana State Fair and many more. Lot 9: Broker x Hairietta	D.O.B. : Feb	Reg. : 50% Simmental	Heifer	Full sib to many Champions including Stewart Skiles high seller last year with wins at Louisville, Houston, and KILE. Dam was Supreme Champion Female Iowa State Fair for Sara Sullivan. Full sib to $90,000 high seller and Champion Shorthorn Plus last year in Louisville for Stewart Skiles. Granddam was many time Champion for Bloomberg family. Dam was Supreme Female in 2014 NAILE Junior Show. Dam was National Champion Chi and heifer is maternal sib to Grand and Reserve at 2017 Junior Nationals. Maternal sib to Boyert's, Reimann, and Smith high seller as well as Kelton Arthur’s Denver Champion. Maternal sib to the Champion Mainetainer Female 2017 Illinios State Fair. Dam was many time Champion including big wins at Louisville and Kentucky Beef Expo. Dam is full sib to Who Dat Lady, Who’s Your Lady, and many more. Maternal sib to Cole Mize’s many time Champion Shorthorn Plus a few years ago. Full sib to the 2016 Champion Shorthorn Plus Female at NAILE. Full sib to Katie Mize’s and Taylor Morbitzer’s many time champion females this past year. Full sib to $60,000 high seller and Reserve Grand Female Kansas Beef Expo. Dam was multiple time Champion including big wins at Louisville and Kentucky Beef Expo. Dam is full sib to the Supreme Female in Louisville known as the “Stine”. Pebbles produced Champions in both the Purebred and Composite show at the 2017 Junior Nationals. Dam was Supreme Female at Hoosier Beef Congress and Reserve Grand Female in Louisville. Dam was Calf Champion in Louisville and many time Champion for Presley Wiley. Initial bids must be in by Sunday, September 10, 2017 at 6:00 pm. 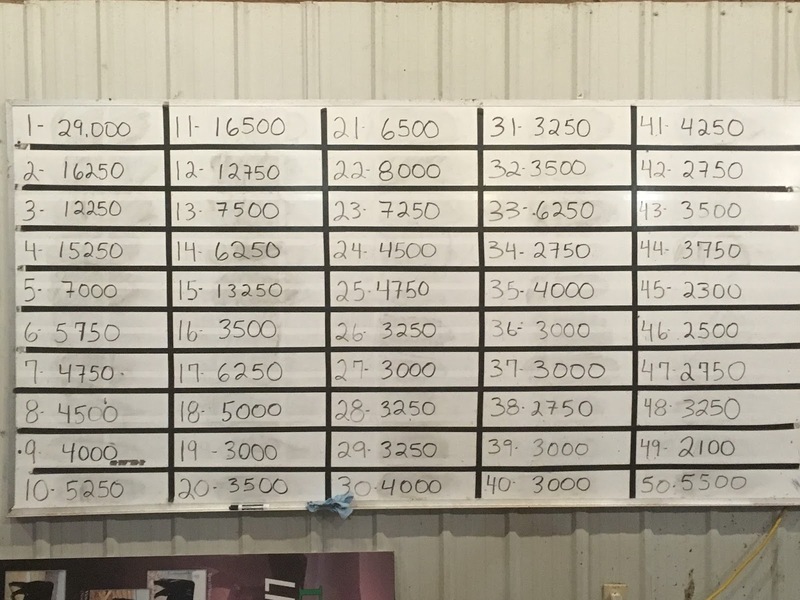 Calves will be bid-off by phone starting after 6:00 pm on Sunday. The highest price on the bid board will be first calf bid off. All calves must be picked up within 2 weeks of the sale unless other arrangements have been made. All calves were vaccinated with Pyramid 5 + Presponse and Caliber 7. All heifers were calfhood vaccinated and will receive Express 10. Schaeffer/Tice reserves the right to 6 embryos on all heifers in the sale at our expense and buyers convenience. Each buyer, while attending shows with Schaeffer Show Cattle, will be charged $150/day per animal at the following shows: Keystone, Louisville, Denver, and Junior Nationals. This will cover all expenses for the animal at shows. All animals must be insured during their time in the care of Schaeffer Show Cattle. Who Dat Lady 2037Z: Who Da Man x JSUL 6640 National Champion Chianina Female NAILE 2013, many time Supreme Female 2012-13. Bid board update on Sunday, September 11, 2016 at 3:45 pm. Bid board update as of Wednesday, September 7th at 9:00 pm. Bid board update as of Sunday, September 11, 2016 at 1:30 pm. Bid board as of 10:00 pm Wednesday, August 16, 2017. 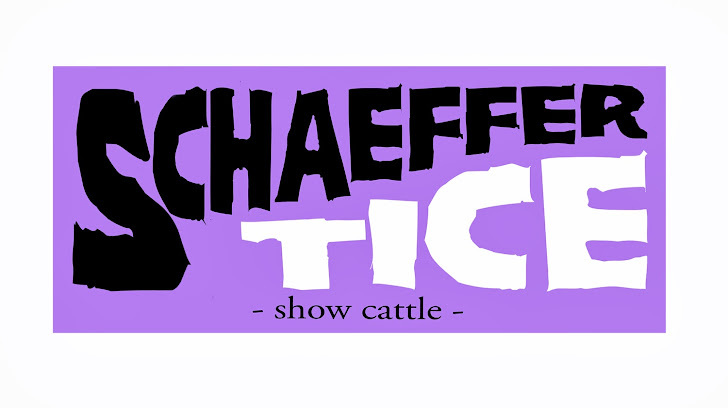 Welcome to the Schaeffer Show Cattle and Schaeffer & Tice blog. Located in Hagerstown, Indiana just minutes from Interstate 70, Schaeffer Show Cattle/Schaeffer & Tice is here for all your cattle business needs. Contact Tim Schaeffer at 765-541-0738 or Nate Tice at 717-926-0874. Schaeffer Show Cattle. Awesome Inc. theme. Powered by Blogger.